As I was making my daily matcha today, I thought about a speaking opportunity I'd applied for a few months ago. I'd submitted proposals a few times to speak to this particular conference and I had all but written them off because the deadline to announce speakers had passed once again . I sensed negative thoughts and began to feel angry and frustrated. I was thinking how many great speakers go unnoticed and getting madder by the minute. I began wondering why I didn't get selected. I started questioning whether I'm good enough, self-doubt began creeping in and I firmly decided I wouldn't re-apply a third time. By the time I'd finished making my matcha the feelings had passed, much like dark clouds moving across the sky and before I knew it, I was feeling my normal self again. As I walked over to my desk I noticed a new email in my in-box from none other than the conference I was just stewing over! (The universe amazes me). My heart began beating a little faster as I clicked on it and read that they had selected most of their speakers, but were still considering a few others and I was one of them. Instead of jumping right back into my next task for the day, I stayed with this unexpected great moment, savouring it for a while longer. I processed and let go of feelings of self-doubt and got double the pleasure from this unexpected good news, by holding it in my awareness for a few extra moments. You want to find the present moment. When we're present during turbulent moments, and by this I mean having awareness of our thoughts, feelings and body sensations during the turbulence, we're in control. We're more likely to regulate our emotions and stay focused - and less likely to be yanked around by our emotions and become reactive. When we take control in this way, we lesson the impact of difficult emotions and are more open to possibilities. When we're present during the good times, we increase their benefits and reinforce the positive impact they have on us. We can choose to capture a positive experience in our awareness, savour it for a while longer, and double our pleasure! Your breath is easy to access anytime and anyplace. You don't need to shut yourself away in a dark room to leverage it. Find your breath and keep coming back to it when you get distracted. Feel your chest expanding and contracting. Notice tensions in the in-breath and let them go in the out-breath. It's critical to get out of your head and into your body. We're using our body as a guide into the present moment. You want your focus to shift from your head to the ground. Let gravity pull your focus to the ground. Find your feet, notice the physical sensations of your feet connecting with the ground. Notice warmth, pressure, tingling, tightness. You're not thinking about your feet. Ask yourself: am I here? It's seriously simple and seriously effective. Ask yourself a few times a day, am I present? How do I know I'm fully present? 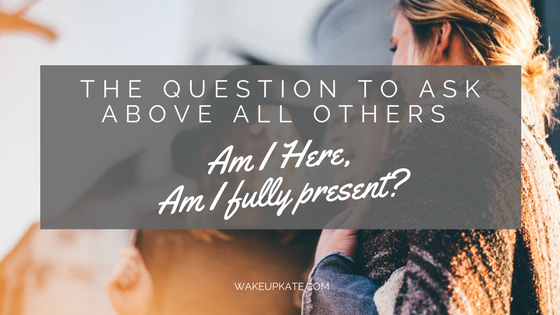 What is it that you notice right now, that lets you know you are 100% fully present? Are you aware of how you're feeling right now? Can you feel your feet on the ground? When you can honestly say you're fully aware of these things, then the answer to the question is simple. You are present. If you'd like to learn how to apply the techniques I shared today without adding to your to-do list, join my Free 7-Day Mindful Challenge starting soon.